We include an update on the current status of the Desert Jewels project which aims to improve management of mound springs. Internationally respected hydrogeologist and FOMS member Dr MA (Rien) Habermehlprovides an overview of the Great Artesian Basin and mound springs. We report on the two FOMS field trips of June and August 2015. FOMS member Brian Donaghy poses some questions about mound springs –partly with tongue in cheek but also with a serious edge. We also report on an overhaul of the FOMS website. Canberra-based Dr MA (Rien) Habermehl is an internationally recognised hydrogeologist who has decades of experience in researching the Great Artesian Basin and its associated mound springs. Dr Habermehl is a FOMS member and accompanied the group on its field trip in August 2015. Here Dr Habermehl provides an overview of the GAB and its springs. The Great Artesian Basin is a confined groundwater basin, which underlies arid and semi-arid regions across 1.7 million km2 or one- fifth of Australia. The basin’s groundwater resources were discovered around 1880, and their development allowed the establishment of an important pastoral industry. Pastoral activity, town water supplies, mining and petroleum ventures are all totally dependent on artesian groundwater. The Great Artesian Basin is a multi- layered confined aquifer system, with artesian aquifers in Triassic, Jurassic and Cretaceous continental quartzose sandstones. Intervening confining beds (aquitards) consist of siltstone and mudstone; Cretaceous marine sediments form the main confining unit. The Basin is up to 3000 m thick, and is a large synclinal structure, uplifted and exposed along its eastern margin and tilted southwest. Recharge occurs in the relative high rainfall eastern margin, and the western margin in the arid centre of the continent receives minor recharge. Regional groundwater movement is towards the southern, southwestern, western and northern margins, where artesian springs discharge and produce carbonate mounds. Average groundwater flow rates in the eastern and western marginal parts range from less than 1 to 5 m/year based on hydraulic data and 14C, 36Cl and 4He measurements. Chlorine-36 and carbon-14 isochrones show residence times from recent to several thousand years near the marginal recharge areas, to more than one million years near the centre of the Basin. 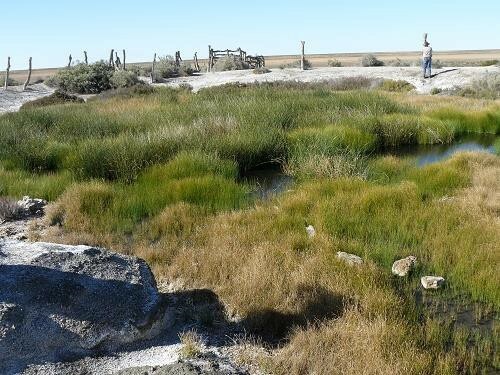 Environmental (stable and radio-active) isotopes and hydrochemical studies confirmed the source and origin of artesian groundwater as meteoric water, which recharged from geological to modern times. Potentiometric surfaces (pressure levels) of the Triassic, Jurassic and Early Cretaceous aquifers are still above ground level, but pressure drawdowns of up to 100 m were recorded from 1880 to the 1990s in some relatively closely developed areas. Artesian groundwater extraction by the pastoral industry and for homestead and town water supplies, which peaked at about 2000 ML/day around 1918, caused this drawdown. About 4700 flowing artesian water bores were drilled in the main Lower Cretaceous-Jurassic aquifers at depths of up to 2000 m, but average 500 m. About 3100 controlled and uncontrolled artesian waterbores remain flowing with an accumulated discharge of 1500 ML/day. 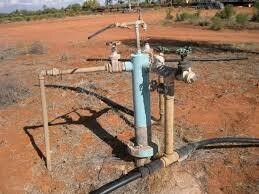 About 25000 non-flowing artesian water bores, generally using windmill operated pumps, tap shallower Cretaceous aquifers. Some flowing artesian water bores ceased to flow, necessitating groundwater to be pumped and spring discharges declined, caused by water bore development and resultant lowered artesian pressures in many parts of the basin during the last 130 years and in some areas springs have ceased to flowGroundwater quality of the Lower Cretaceous-Jurassic aquifers is good at 500 to 1500 mg/L total dissolved solids. 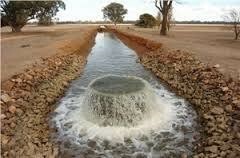 Groundwater is suitable for domestic, town water supply and stock use, though unsuitable for irrigation in most areas. The water is of the Na-HCO3-Cl type, and these ions contribute more than 90 % of the total ionic strength of solutes in the main Basin area. In the southwestern part of the Basin the groundwater is characterised by Na-Cl-SO4 type water, and the two regional groundwater flow directions show different hydrochemical characteristics, with westward flowing water being of the Na-HCO3-Cl type and eastward flowing water being of the Na-Cl-SO4 type. Water quality is better in the lower aquifers than in the higher aquifers in the Lower Cretaceous- Jurassic sequence. Groundwater temperatures at the bore-heads range from 300 to 1000 C, and are a potential geothermal energy source. Spring temperatures range from 200 to 450 C.
Prior to the 1960s, artesian water use was mainly for pastoral, homestead and town supplies, but since then the development of petroleum resources in the basin area also used its groundwater. The basin (and underlying rocks) comprises abundant hydrocarbon reservoir (and some source) rocks, and commercial and sub-commercial oil and gas is produced from Jurassic and Cretaceous sandstones, contradicting earlier beliefs that the basin-wide groundwater throughflow had flushed out hydrocarbons. Since the 1980s, mineral mining in and near the basin started using the basin’s artesian groundwater, in particular from the Olympic Dam bore-fields in South Australia and mines in north-western Queensland and north- eastern New South Wales. Present day and future additional oil and gas, mineral mining, coal seam gas and geothermal developments could affect artesian groundwater flow to water bores and springs. 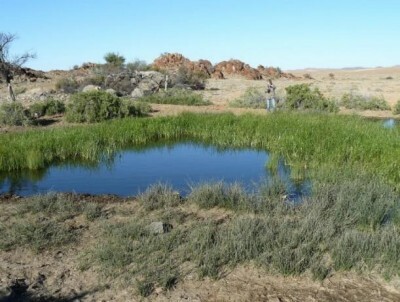 Environmental geology issues relate to the development of the artesian groundwater resources of the Great Artesian Basin and include aspects of sustainable groundwater use and groundwater and rangelands management. Extraction of artesian groundwater during the last 130 years has affected the Basin to varying degrees through large scale drawdowns, which reduced artesian pressures and reduced discharges from artesian water-bores and springs. 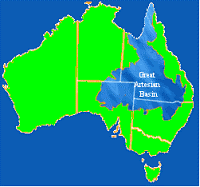 The Great Artesian Basin Bore Rehabilitation Program (GABBRP, 1989-1999) and the subsequent Great Artesian Basin Sustainability Initiative (GABSI, 1999-2014) which provides a substantial level of Australian Government and State Government assistance to landholders to rehabilitate flowing artesian bores and replace the open earth bore drains of free-flowing artesian bores with piped water distribution systems throughout the GAB. GABSI assists the implementation of the GAB Strategic Management Plan prepared by the Great Artesian Basin Coordinating Committee (GABC 2000). he Plan provides for the restoration of the environmental assets of the Great Artesian Basin with an emphasis on springs (GABC 2000). Following the implementation of GABSI and rehabilitation of bores and reduction of their outflows, potentiometric surfaces have become stable and increased in some areas and may increase flows from springs. 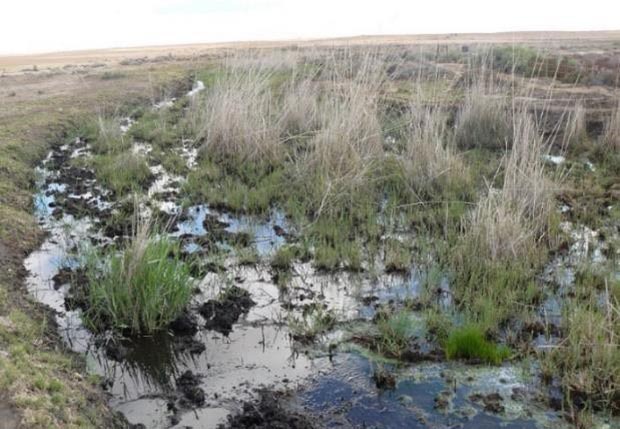 Securing groundwater flows to springs, particularly those with high conservation values, could be an addition to the criteria used to select bores for rehabilitation and piping to maximise opportunities to sustain or re-activate springs. The GABSI program has recently (2015) been extended for a period of three years. These programs aim to rehabilitate waterbores in poor condition and equip bores with control valves. The replacement of the inefficient open earth drain distribution system, which causes up to 95 percent wastage of the water, with a piping system is encouraged. These measures will benefit groundwater and rangeland management. In addition, the Environment Protection and Biodiversity Act (EPBC) 1999 provides environmental protection for the GAB springs, and is the main regulation tool for larger developments. Groundwater use by the petroleum and mining industries during the last 20 – 35 years affect some parts of the Basin. The South Australian part of the Basin is an example where the combination of groundwater exploitation for the pastoral industry, town and homestead water supplies and petroleum and mining industries impact on the Basin’s groundwater conditions and on the artesian springs, the natural outflow points of the Basin. The natural flowing artesian springs originating from the Jurassic-Lower Cretaceous aquifers occur throughout the GAB, though mainly in the marginal areas, within twelve large supergroups, including the Barcaldine, Springsure, Bogan River, Bourke, Eulo, Lake Frome, Lake Eyre, Dalhousie, Mulligan River, Springvale, Flinders River and Cape York. 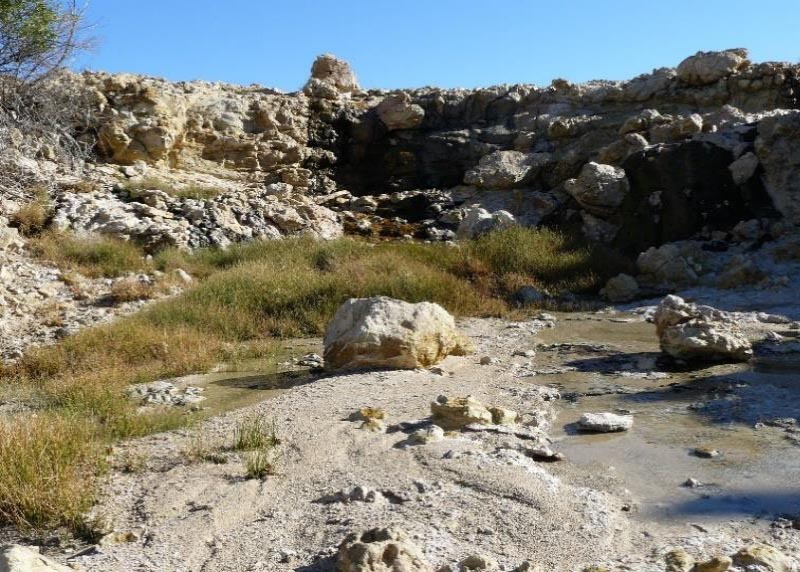 Most springs are concentrated in relatively small areas, with rates of discharge of individual springs ranging from less than 1 L/s to about 150 L/s (from a spring at Dalhousie Springs, northern South Australia). 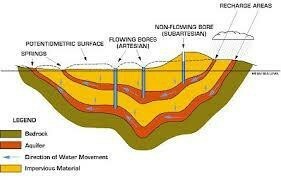 Flowing artesian springs within the Basin and in the discharge margins of the Basin are generally associated with structural features, such as faults, folds, monoclines and intersecting lineaments. Upwards groundwater flow along faults is the source of many springs, as well as the abutment of aquifers against impervious bedrock and pressure water breaking through confining beds near the discharge margins of the Basin. 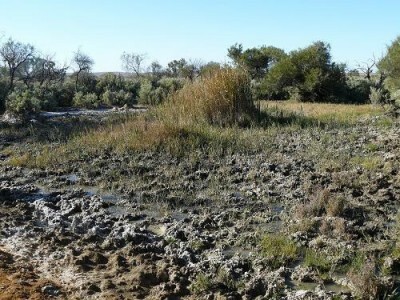 Diffuse discharge occurs from the artesian aquifers near the margins where the overlying confining beds are thin and waterlevels high. 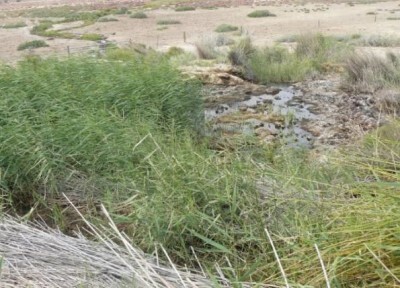 Springs are quite common in the recharge areas along the eastern margins, but most of these springs are the result of “overflow” or the “rejection” of recharge into the aquifers, or result from the intersection of the local topography and aquifers. Many springs have built up conical mounds consisting of deposits of clayey and/or sandy sediments and carbonates, which are several metres to several tens of metres in diameter, and up to several metres high. The mounds are formed by deposition of particles brought up from the aquifers and the confining beds, by accumulation of aeolian material and by the chemical and biological precipitation of solids dissolved in the artesian groundwater. Some mounds consist of mud, but many mounds, particularly those built by springs in the western and southwestern margin of the Great Artesian Basin are built up of carbonates, which are dominated by tufa, travertine and very fine-grained limestone or crystalline carbonate, mainly calcite and dolomite. The carbonates originate from the combined chemical precipitation of calcium carbonate out of the artesian groundwater, and precipitation by algae and bacteria. Terraced mounds and waterfall or cascade deposits produced by algae are common, though most accumulations consist of steeply sloping mounds. These springs are terminal evaporitic systems, usually comprising a central carbonate mound, with outer zones dominated by sulphate and chloride salts. Mound morphology is controlled by several factors, including groundwater discharge rates, hydrochemistry, evaporation, influence of inorganic versus organic carbonate precipitation and local subsidence of the mound. The natural flowing artesian springs and their spring mound deposits in South Australia are of particular significance and interest as the deposits are geological (and hydrogeological) records because of their fossils of fauna and flora, their ages, and their relationship to wetter and drier times (palaeoclimates) in central and eastern Australia during the last several 100 000s years and changes in groundwater discharges and spring deposits, their Aboriginal and early European history and culture, and the presence of unique flora and fauna. Artesian springs and their deposits in the Lake Eyre region in the southwestern part of the Basin range from topographically high springs to younger, topographically low springs as a result of the lowering of the land surface and spring outlet levels in Quaternary times (deposits of extinct pre-Quaternary springs occur more than 40 m above the present springs). Fossil carbonate spring deposits of Pleistocene ages, consisting of very fine- grained carbonates with abundant reed casts, gastropod shells and algal structures, rise several tens of metres above the present land surface where the present active springs (and Recent spring deposits) occur. The higher, older spring carbonates cap circular mesas and hills and overlie pedestals of Cretaceous mudstones (Hamilton Hill, Beresford Hill and Strangways Springs). This also indicates that the potentiometric surface in the Lake Eyre region has declined considerably during recent geological time. Morphological diversity and lithofacies patterns indicate that the spring complexes have developed over several climatic cycles. The dated ages of spring deposits range up to 740 000 ±120 000 years, with some spring deposits probably being older. The ages of several basal spring deposits, as determined from thermoluminescence, 14C, U/Th and palaeomagnetic studies suggest that some springs might have been (re-) activated as a result of major climatic changes. An increased awareness and understanding of the springs and environmental aspects since the 1980s has helped to preserve the springs, despite increased groundwater development by pastoral and resources industries and increased tourism and visitor numbers, and through the creation of the Witjira (Dalhousie Springs) National Park and the Wabma Kadarbu Mound Springs Conservation Park. The provision of access to some good examples of springs in these Parks, fencing and explanatory signs and other guidance, has and should offer regulated access and limit environmental damage to the accessible springs and to other springs within fenced areas. 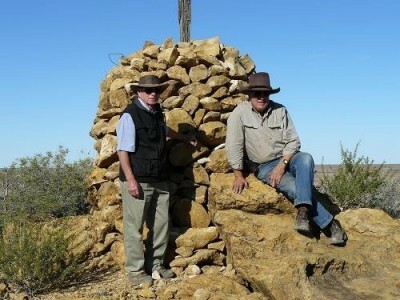 The cooperation between landholders with springs on their properties and government authorities has resulted in successful management, though further activities, including fencing, should be undertaken to exclude grazing and trampling by livestock and feral animals. 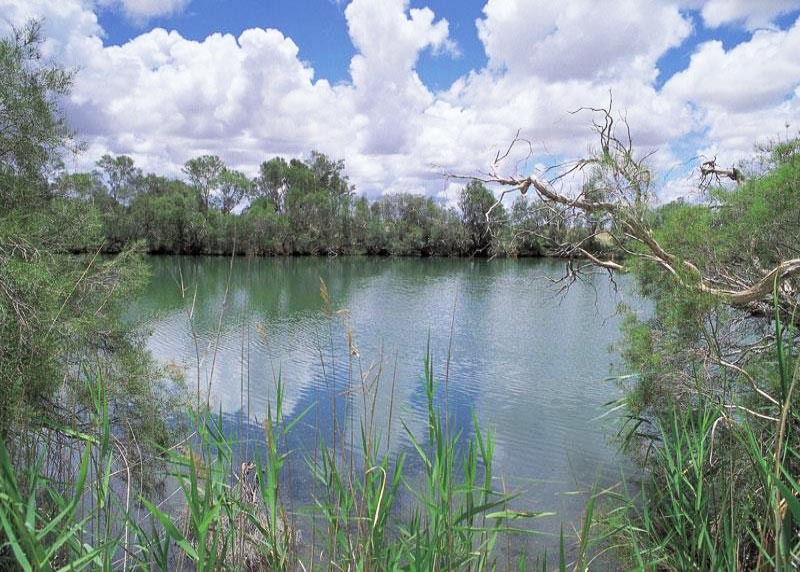 A large number of scientific studies on the springs, by Australian Government and State Government organisations, universities and resources industries, as well as long term monitoring of their flora and fauna, environmental aspects, nature and origin, including the deposition and composition of the spring mound sediments, their ages and the groundwater flow and hydrochemistry, has significantly increased knowledge about the springs since the 1980s, though continuing monitoring and additional studies should be carried out. 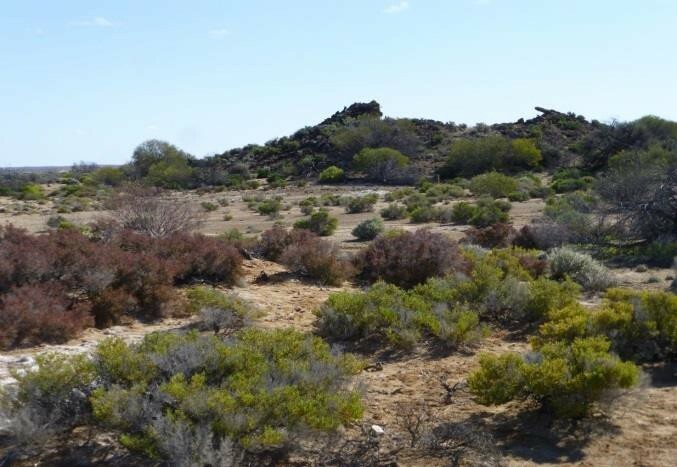 Previous newsletters have included progress reports on the Desert Jewels project a three year, $1m project funded through the Australian Government to develop improved management programs for South Australia’s mound springs. DEWNR has led this project but FOMS is a significant partner and has had considerable input. The project commenced in mid 2013 and is due for completion in June 2016. 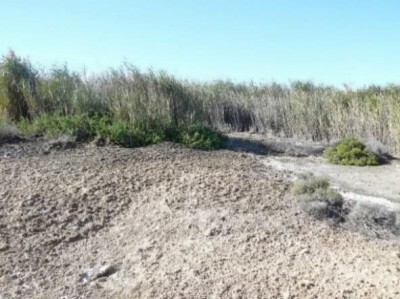 While the Desert Jewels project has several facets, including fish surveys at Dalhousie Springs, FOMS’ involvement has focussed on improved management of springs subject to cattle grazing and of springs that have been protected from grazing but where proliferation of reeds (Phragmites) appears to be impacting upon other spring flora and fauna. Interestingly, at some springs fenced to exclude cattle in the mid 1980s and where reed growth has been prolific, there are signs that the reed growth is now waning. One theory is that a long history of cattle ingress led to elevated nutrient levels which, in turn, prompted prolific reed growth when cattle were excluded. 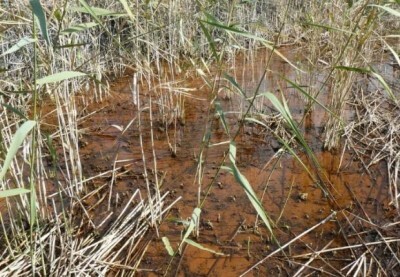 In springs where reeds are now declining, it may be that nutrient levels are gradually diminishing. This has been a complex project and progress has not always been optimal. Burning trials at Beatrice, the Fountain and Big Perry Springs. Burning may hasten the nutrient reduction process and therefor expedite the diminution of reed growth. Fencing of Levi Springs on the Peake Pastoral Lease. These are important springs: Peake lessees S Kidman & Co have been very supportive of this fencing proposal. Fencing of a spring on Billa Kalina Station, whereupon a controlled grazing trial will be run in collaboration with Billa Kalina manager Colin Greenfield. Water and sediment testing will be undertaken, including nutrient sampling. The above work requires clearance by the local Arabana community and negotiations about this have been undertaken. DEWNR Project Officer Sam Gitahi and FOMS’ Simon Lewis met with the Arabana Directors’Group in early September 2015. FOMS will continue its involvement in this work and may have a longer term role in helping with data collection and monitoring. More information about FOMS’ involvement in the Desert Jewels project is included in the FOMS trip reports. 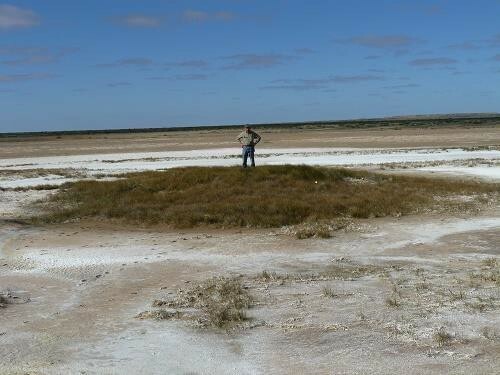 This second FOMS trip for 2015 aimed to inspect springs south of Lake Eyre South to assess their current status; to inspect Beresford Hill and nearby springs; to check walking trails at Strangways; and to inspect springs on Billa Kalina, including the spring proposed for fencing as part of the Desert Jewels project. Those participating were Colin Harris, Rick Moore, Rien Habermehl, Bruce and Sherrie Gotch, Stafford Dow, Allan and Marlene Swinstead, Brian Donaghy, Bernice Cohen and Simon Lewis. Tony Magor, Manager Public Lands and Co-management, DEWNR, joined the group on the evening of Wednesday 5 August. Cool but dry and sunny conditions prevailed throughout the week, with moderate breezes for the first few days, abating towards the end of the trip. The day temperatures were around 180 C during the days and nights were generally calm and cool, around 50 to 70 C, becoming cold on the Wednesday and Thursday nights – around 0 degrees on the Friday morning. Roads and station tracks were in good condition. Colin, Brian and Simon travelled to Port Augusta to rendezvous with Bernice. The remainder of the group travelled further north that day and camped at Farina overnight. The group convened at Marree on Sunday 2nd and subsequently inspected Herrgott Spring. Colin and Simon also caught up with Arabana elder Reg Dodd who has provided much assistance with mound spring matters over many years. The group then moved on to Finniss Springs and inspected the West Finniss spring group. 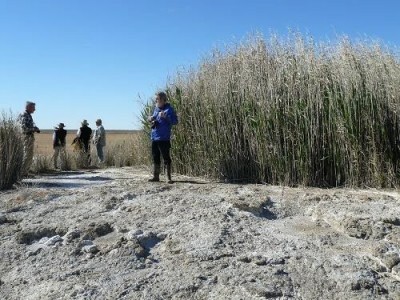 The West Finniss group comprises a large number of spring vents with virtually all dominated by reeds, Phragmites, up to about three metres in height. Typical for this time of year, the Phragmites has “hayed off” with little active (green) growth. Other species noted included Cyperus laevigatus (bore-drain sedge), Gahnia (cutting grass) and Baumea (twig rush). The endangered plant, Eriocaulon carsonii (salt pipe wort) has been noted previously at West Finniss but no occurrences were noted despite a relatively thorough search. This raises the question of whether the proliferation of Phragmites has impacted upon the Eriocaulon population. The day commenced with an inspection of a geological fault-line on the Oodnadatta Track near Hermit Hill. Eminent GAB hydrogeologist and Canberra-based FOMS member Rien Habermehl provided a detailed description of the fault-line and its links with the GAB, along with more general information about the nature and hydrogeological history of the GAB and its associated springs. The exposure of the Algebuckina Sandstone at the site was inspected. The Algebuckina Sandstone is the main GAB aquifer west of the Birdsville Track (Ridge), and the source of artesian groundwater for all of the GAB springs in this part of South Australia. The group then inspected Hermit Springs, around the back (ie northern side) of Hermit Hill. 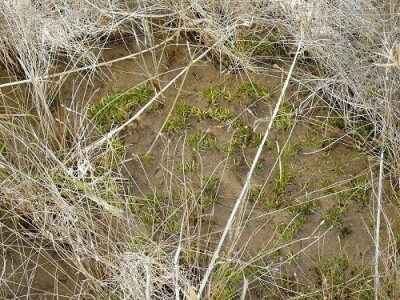 As for West Finniss, the Hermit Springs comprise many spring vents dominated by haying off Phragmites, with a similar range of species to that listed above. A reasonably thorough reconnaissance located just one patch of Eriocaulon carsonii. There is some indication that the proliferation of Phragmites is having a negative impact upon associated spring flora, including Eriocaulon. During the afternoon the group visited Smith, Gosse and McLachlan Springs near Lake Eyre South. Smith Springs comprise three or four low mounds, with very low flow, and with virtually a monoculture of Cyperus laevigatus (bore drain sedge). These springs occur just a few metres into Finniss Springs, alongside the boundary fence-line with Stuart Creek pastoral lease. At Gosse Springs, six vents were observed, with two main vents. One comprised a fine bore drain sedge spring with a pool of open water and extensive tail. Two brolgas were observed here. 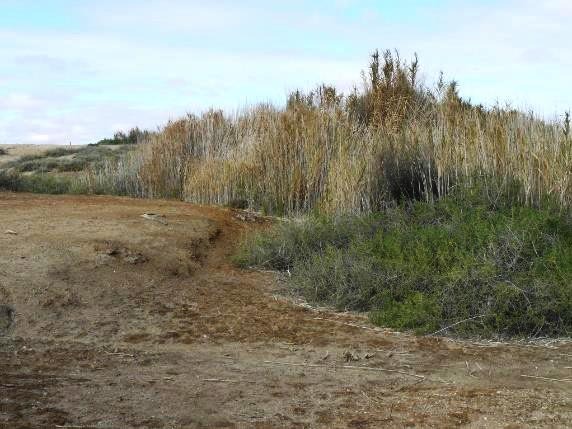 The other main vent comprises a relatively large Phragmites / Cyperus laevigatus mound with a much smaller tail. 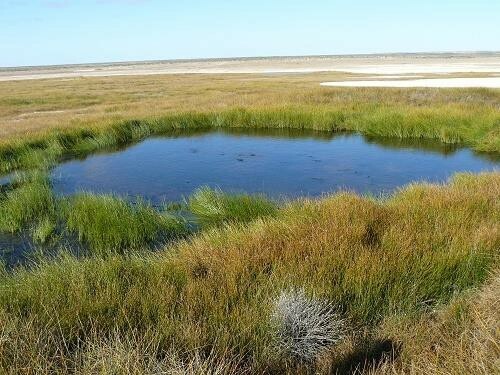 McLachlan Springs are very close to the shores of Lake Eyre South. 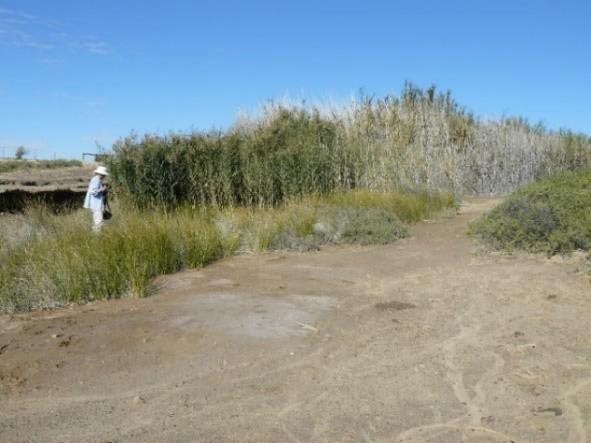 There is one main mound, with Phragmites and Cyperus, and two smaller mounds to the north with stunted Phragmites. A feature of Smith, Gosse and McLachlan Springs is their good condition. They appear to have been free of grazing pressure for a considerable time. The group returned to the Gregory Creek camp-site for one more night. The group decamped and moved on to Fred Spring, on Stuart’s Creek not far north of the main road. Unlike springs seen thus far, Fred Spring comprises a Typha (bulrush) spring, with fringing Cyperus laevigatus (bore-drain sedge). Like the other Stuart Creek springs north of the main road, Fred is in good condition with no evidence of recent grazing impacts. Fred Spring was the site of a blow-out in the 1980s when a bore was sunk near the spring and there was a major leakage of artesian water. Rehabilitation works were then carried out and the spring appears to have recovered well. Then it was on to Emerald Spring, about 11.5 km from the main road just past Curdimurka and just over the Margaret Overflow. Emerald Spring has mainly Phragmites at the vent, but there is a patch of Typha growing in the centre of the vent. There is some suggestion here and elsewhere that Typha may have some sort of competitive advantage over Phragmites in the slightly fresher water right at the spring vent, with Phragmites better adapted to the more saline conditions away from the water outlet. Bore drain sedge, C laevigatus dominates the extensive tail which extends several hundred metres. Emerald Spring is fenced tightly around the vent and there is a second fence encompassing several hectares around the spring. This second fence is in a state of disrepair and is falling down in places. Interestingly, the spring tail now extends through what was the vehicle entrance in this second fence, preventing access at that point. This indicates that either the spring tail has shifted or that the flow from this spring has increased, causing an extension of the tail. Some grazing pressure is evident along the tail. The group then journeyed on to Beresford Hill and the adjacent Beresford and Warburton Springs. The springs and hill were fenced some years ago by S Kidman and Co to conserve their features. Water temperature, electrical conductivity (EC) and pH were measured by Bruce and helpers using the FOMS test kit. Warburton Springs comprise two vents. One vent comprises solid Phragmites up to three metres high with only a small outflow down the tail. The second spring is predominantly C. laevigatus (bore-drain sedge) with some open water and with a Cyperus tail extending about 100 metres or more. Beresford Spring comprises one main vent. Its vegetation is predominantly C. laevigatus but there is mud rather than open water in the vent with the bones of cattle that became bogged and perished there in times gone by. The more energetic members of the party climbed Beresford Hill, an extinct spring, with approximately the upper one-third of its height of 45 m covered by spring limestone, overlying the mudstone of the Bulldog Shale. 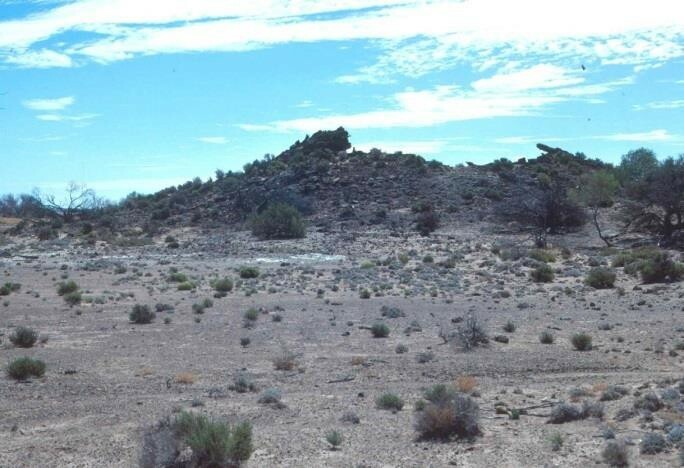 An extensive former pool related to the spring vent is evident at the top of the Hill and there is also an Aboriginal stone arrangement. Rien Habermehl noted that Beresford Hill spring limestone is dated at more than 700,000 years of age and also showed us examples of what appears to be fossilised Phragmites, suggesting that Phragmites has been in spring country for a very long time. There is also a trig survey cairn of stones at the top of the Hill. The group then travelled on to Strangways Springs, setting up camp in the Strangways dunes. During the morning the group checked the walking trails established by FOMS volunteers in 2011 – the 1.8 km Springs Walk and 2.2 km Woolwash Walk. Both trails were in good condition. Along the Woolwash Walk, the group paused at location 16, a site where Rien Habermehl had drilled a fully cored exploratory hole in 1985 as part of his GAB research. This drill-hole and another drill-hole in the eastern part of the Strangways platform showed the thickness of the limestone platform to be less than 5 m in those locations. Around the ruins at Strangways we noted that the building identification signs are deteriorating and require replacement. Heading south towards Billa Kalina Station we met briefly with Anna Creek Station Manager Norm Sims. Once on Billa Kalina we inspected two springs fenced by the lessees Keith and Colin Greenfield in the early 2000s. Bruce and helpers used the FOMS TPS water testing kit here to measure temperature, pH and electrical conductivity (EC). The fenced area is of interest in that one of the springs has dense Phragmites, while the second spring, about 50 metres away, is a C. laevigatus spring with no Phragmites. This is one of several examples in spring country where some springs have remained free of Phragmites despite their close proximity to springs dominated by Phragmites. The Phragmites spring has a bore and associated water pressure and flow monitoring and recording equipment immediately adjacent to the vent. Near this fenced area, we inspected the ruins of a former accommodation building, believed to have serviced drovers & the travelling public on the former Travelling Stock Route from the Kingoonya-Tarcoola district to Coward Springs. Camp-sites in this vicinity were not of prime quality but we settled on an area with elegant wattle (Acacia victoriae) and enough dead timber for firewood. At around 7.30 pm, headlights on the north-east horizon marked the approach of Tony Magor, who joined us for the night and part of the next day. That evening, Rien Habermehl took the group through his power-point presentation describing the hydrogeology of the GAB and of the mound springs, including groundwater dating and spring mound deposits dating. Heading south-west, we soon came to Spring Creek, comprising several spring outlets right on the station track. This was a delightful setting but heavy cattle impacts were evident. Water samples were tested using the FOMS water testing kit. Spring Creek includes two or more spring outlets. One is slightly away from the creek- line: it is a Phragmites spring heavily impacted by cattle. Within the creek-line are one or more spring outlets, with Phragmites at the vent and more extensive tails of C. laevigatus (bore-drain sedge): again with significant cattle impacts. From Spring Creek the group continued down the track to Cheryl’s Yard. At Cheryl’s Yard is the take-off point to the spring to be fenced as part of the Desert Jewels project – a short but rough cross-country drive necessitating unhitching of caravans / trailers. The spring to be fenced is a bore-drain sedge (C. laevigatus) spring with some open water at the pool. It has a reasonably extensive tail of C. laevigatus and displays some cattle impacts – although not as severe as at Spring Creek. Old fence-posts surround the vent, indicative of earlier fencing. The fencing will provide permanent protection for the spring vent from cattle grazing, while allowing occasional grazing of part of the spring tail. Another section of the spring tail will be outside the fenced area and thus open to general grazing. This was the last of the spring surveys for the trip. After a lunch in the coolibahs, Tony, Allan and Marlene commenced their respective journeys homeward. Bruce, Sherrie and Stafford turned around and headed back up the track towards Beresford, intending to be at Balcanoona by the following day. The remainder of the group continued on towards Billa Kalina homestead, meeting lessee Colin Greenfield on the way and then spending a few minutes with his wife Jill Greenfield at the homestead. We then drove about 60 km down the track to camp at a very nice spot in red dune country. For Colin, Bernice, Brian, Rick, Rien and Simon it was a case of homeward bound through Woomera and Pimba, with lunch for some at the Arid Lands Botanic Gardens at Pt Augusta in company with fellow FOMS member Brenton Arnold. In summary, a very successful trip: great company, fine weather, interesting springs and a trip that ran almost exactly to schedule throughout. Many thanks to all! 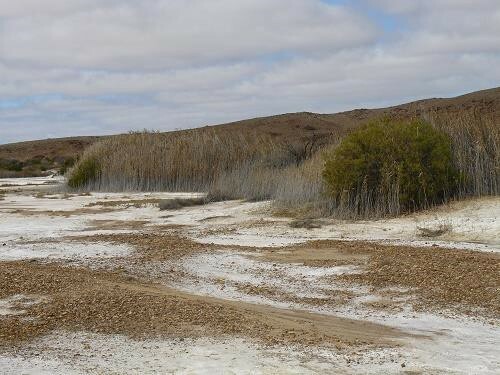 As reported elsewhere in this newsletter, the Friends of Mound Springs (FOMS) are working with the Department of Environment, Water and Natural Resources (DEWNR) on a major project – the Desert Jewels Project – which aims to improve the management of South Australia’s mound springs. This report describes the field trip held in June 2015 to visit springs on the Peake pastoral lease to consider management trials and fencing options. A second objective was to check the walking trails established by FOMS in 2011 at Strangways Springs and the Peake Overland Telegraph / Freeling Springs site. Participants: Sam Gitahi (DEWNR Desert Jewels Project Officer), Sam Stuart (Arabana liaison officer), Clinton Warren, Colin Harris, Elaine Smyth, Bruce and Sherrie Gotch, Margie Barnett and Simon Lewis. Brendan and Elizabeth Lay also intended to join the group but were prevented by wet weather which led to the closure of roads in the area. Weather Conditions. As noted below, weather proved to be a limiting factor with this trip. Rain was predicted for the start of the trip as far north as Leigh Creek but not for the springs country further north. With just a little trepidation, therefore, we decided to proceed with the trip. 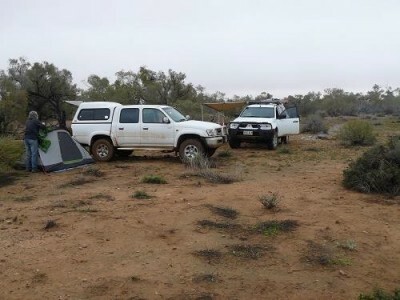 Several participants drove to Port Augusta or thereabouts to stay overnight on Saturday 13 June. Sam Stuart and Clinton Warren travelled in advance of the main party and reached William Creek by Saturday evening. On Sunday 14th the Port Augusta contingent awoke to drizzling rain and a report that both the Borefield Road and Marree to William Creek road were closed to traffic. However, a phone call to the Peake Station revealed that little rain had fallen in that area. 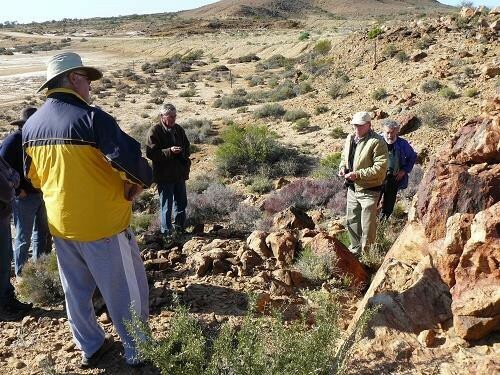 The group travelled to William Creek via Coober Pedy, meeting Sam Stuart and Clinton. With light fading fast the group moved north to camp on Douglas Creek north of William Creek. In very foggy conditions, Colin, Elaine, Bruce and Sherrie headed off to the Peake Overland Telegraph site to check the walking trails and replenish the brochure supply. Sam G, Sam S, Clinton, Margie and Simon inspected Big Perry, Fountain, Twelve Mile and Outside Springs. Comments on those inspections are provided on the next page. Following the above work, the group selected an overnight camp-site on Bulldog Creek. Later that evening, after a display of lightning to the NW, some steady rain set in, with around 9mm recorded at the nearby Peake homestead. That precipitation was to significantly influence our program over the next two days. Following the rain of the previous night, an exploratory drive suggested that the station tracks might be firm enough for the group to continue to Levi Springs. The group did make it to Levi, although the going was a little heavy at times. However at Levi there was a hitch when the lead vehicle crossed a very muddy section and it was decided that the other vehicles should not attempt the same crossing. With the sun shining and a nice drying breeze, it was decided to proceed with our work at Levi Springs and to review track conditions later in the day. The task at Levi was to survey a possible alignment for a fence to enclose Levi springs and most of the impressive basement rocks outcropping at the springs – as well as the ruins of a shepherd’s hut and old coolibah yards nearby. GPS readings were taken to enable an updated map of the proposed fence-line to be prepared. The day concluded with the bulk of the group camping on Levi Creek while the two occupants of the lead vehicle camped near the springs to the south. With another sunny day dawning, the group decided to press on south towards William Creek. However, after a few kilometres, it became evident that the boggy conditions would prevent further travel south. The group turned around and headed back towards the Peake homestead. After negotiating several soft patches along the tracks we reached Peake homestead to be greeted hospitably by newly appointed Peake manager Jim Wheeler and his wife Lee. At this point the group split into three. Margie and Simon, with Thursday commitments at home, made an early departure and drove home via Marree, arriving home somewhat weary by 1.30 to 2 am, Thursday morning. Sam S, Sam G and Clinton left to check camera equipment set up at the Bubbler and at springs near Bopeechee to detect fauna movements. Colin, Elaine, Bruce and Sherrie continued down to Strangways Springs to replenish the walking trail brochure supply. They then spent the night at Coward Springs camp-ground, before returning to Adelaide the following day. In summary, this was an eventful and memorable trip. Rain created a number of difficulties but the group achieved its main objectives and this should help to progress the Desert Jewels project. There are two main vents at Big Perry. The first, at the top of the mound, supports extensive areas of Phragmites. A second lower vent supports Typha. The Phragmites and Typha appeared to be in good condition, with the Phragmites up to 3 metres in height and the Typha up to 2.5 metres. Much of the fenced area is well vegetated, with other common species being Cyperus gymnocaulos, Nitraria sp and samphire species. Trial burn of Phragmites in the upper vent . The single vent at the Fountain has a cover of Phragmites up to about 3m high around the circumference but much lower (up to about one metre) in the centre of the vent. It appears that the Phragmites may be in a state of slow decline in the vent. The tail at the Fountain is also dominated by Phragmites. This area of reeds has expanded substantially over the last 20 years or so. A burning trial is planned for the Phragmites within the spring vent. This area is well separated from boundary fencing. Twelve Mile Spring has multiple vents generally dominated by Phragmites. The top vent is vegetated with Typha, a patch about 8 metres across. The vents have a low but steady flow. Cattle have accessed the fenced area recently and have had noticeable impact on the springs. The Phragmites spring near the station track is a good candidate for a burning trial – but only after the fence has been repaired and the spring has recovered from stock impacts. Outside Springs comprise a number of springs with one fenced vent and a second vent immediately alongside open to grazing. The unfenced spring varies in vegetation quality according to grazing levels. On this occasion this spring showed severe impacts, with heavy pugging and very little vegetation. The fenced spring was observed in 2014 to be showing signs of reduced Phragmites dominance. There is now an area of open water, about 10 metres in diameter with very sparse Phragmites. Other sections have a cover of dead and collapsed Phragmites. There is general agreement that Outside Springs should be left free of any active trials but should be monitored closely.